It’s older than Larry King! The Maryland State Fair is celebrating its 135th birthday this year. Located in Timonium, just off York Road, in Baltimore County, its tons of fun for all the family. You can start off with the “Main Carnival Midway.” Then, you can check out “Kiddie Land,” the “State Fair Park,” “Horseland,” the “Agriculture Farm and Garden Building,” the “Horse Sale Pavilion.” And, if you are up to it, there is also the “Racetrack Infield.” There is even a “46H/FFA Home Arts Building,” a “Sheep and Swine Building,” and a “Cow Palace,” and much more. There is plenty of live entertainment to go around. The schedule changes every day. The fair started on August 25th and ends this Sunday, September 4th. There will be a full day of special events on the 4th, including home arts and farm demonstrations. The program runs from 8:30 am to 8 pm. The Fair itself stays open till 10 pm. There is even a “swifty swine race” at the Fair. The kids will love this one for sure. The food stands are plentiful. I tried out some fried chicken with barbecue sauce and fries, and it was delightful. Parking costs $5 and there’s also $8 admission charge for adults. There’s a discount for the kids – only $3 a head, ages 6 to 13. Children under 5 get in for free. 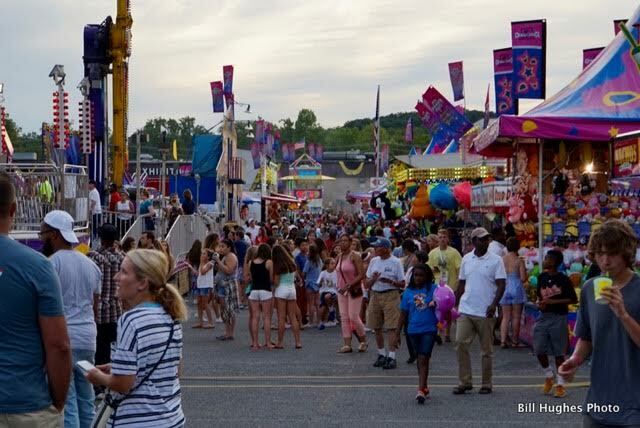 Don’t miss – the Maryland State Fair! To see more photos, go to Facebook.